Mint condition card cover book. As new. 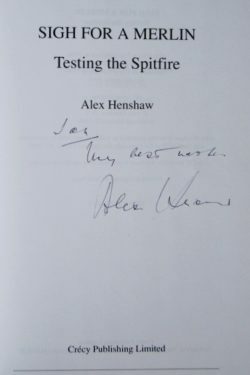 Famous for his pre-war record breaking aviation exploits, Alex Henshaw spent the early days of World War II at Eastleigh testing the immortal Spitfire fighter with Jeffrey Quill before being appointed Chief Test Pilot at Supermarine’s new factory at Castle Bromwich. Thousands of Spitfires were tested and manufactured at this site throughout the war, by the end of which 37,000 test flights had been made with Alex Henshaw flying an estimated ten percent of all Spitfires ever built. Often landing without aids of any kind, his breath-taking aerobatic style and complete mastery of the aircraft were to save his life on several occasions. 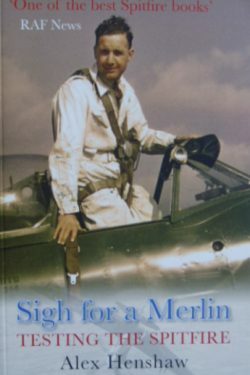 This is one of the classic books on the Spitfire and is essential reading for any enthusiast.